(...) I would like to address this main issue: why commercial yoghurt is unsatisfactory and SHOULD NOT BE USED. This question has been asked me constantly by many people and I have almost run out of patience in going over the biochemistry of this. So, if Mik Aidt would put it into his repository of information on the SCD, I would be most grateful. Practically every dairy in Northern America has Dept. of Agriculture instructions for making commercial yoghurt. They may start with liquid milk straight from the cow (pasteurized) or they may start with milk solids. However, at the beginning, the ADD additional milk solids. This automatically increases the lactose content. For example, if cow's milk originally has 10% lactose (10 gms per 100 mls) then the addition brings it up to 20% or even 30%. The second step is to introduce the bacterial cultures (usually Lactobacillus Bulgaricus and Steptococcus Thermophilus). At this point the acid/base - the pH of the milk - is much like human fluid, around 7.2-7.3 (almost neutral on the pH scale). The bacteria immediately start converting the lactose to lactic acid which is the primary step in making yoghurt. This brings the pH down from neutral to about 4.5 as the lactic ACID accumulates. (Acid lowers pH as our stomach acid brings the pH of our stomachs down to about 2). When the pH hits about 4.5, the bacterial enzymes cannot further convert the remaining lactose. Bacterial enzymes (as is true of all enzymes) are very fastidious as to the acid/alkaline enviroment. Because of the addetional lactose added at the beginning of the process, the yoghurt often contains at this stage as much, and probably more, lactose than a glass of milk would. The companies also use a very short incubation time which is not even sufficient to convert normal milk lactose completely. Dr. Sidney Haas instructed us to make our own yoghurt. I DID!!! When I studied, I had to learn manufacturing techniques and I did to the best of my ability. I never dreamed that people who are sick as those with IBD would challenge and question and balk at this. It is beyond my ability to understand. The book doesn't mention this but you really should boil everything that comes in contact with the yoghurt for a few minutes. If you are using plastic items, you can use a dishwasher with a chlorine based detergent with the heat set on high. try to time your yoghurt making activbity to when the dishwasher cycle finishes. You need to boil for just a minute or so or hold the temp above 60 degrees celsius for at least 15 mins. (this is what the dishwasher should do. As for the milk, its probably best to let it stand covered, for 15 mins before cooling in a tub of water. I have noticed many seem to be having trouble making the homemade yogurt. I hope this information can be of use to you. I don't use a yogurt maker, I make mine in the oven by replacing the oven's light bulb with a 60 watt bulb. A 60 watt bulb keeps the temp at exactly 100 degrees in my oven, so it works perfect for me. I use half & half, not milk to make my yogurt. I bring it to a rolling boil on the stove first to kill all the bacteria in the half & half. I then let it cool to room temp before adding the yogurt culture or you will kill the yogurt culture if its too hot. Then I put it in the oven in a covered container and turn the light on. If I want real thick, rich yogurt, I usually leave it in for 30 or more hours instead of the usual 24 hours. And I never use any of my homemade yogurt as starter for the next batch. I always buy new starter yogurt from the store. I don't like the taste of yogurt when you mix honey in it, so I am trying to find different ways to sweeten it. I found that if you finely chop about a cup of raisins and mix it into the yogurt, then leave it in the fridge overnight, the raisins will sweeten the yogurt very nicely. Strawberries will also work. Kari, I don't know the answer to your question about the affects of temperature (hot or cold) on yogurt after its made. But I hope someone answers it because I would sure like to know. Jim -A very happy New Year to all! >>using a yogurt maker. I expected it to coagulate like commercial yogurt. >>Although it is partially coagulated, it is more of a "runny" consistency. >>Is that normal or did I mess something up? >yogurts contain pectin which I think would thicken it up. >3 quarts of 1/2 & 1/2 yogurt about every 8 days and it tastes great. The yogurt should not be runny. It should be the same consistency of regular commercial yogurt. If it is runny, you likely have done something wrong. Ensure that the starter you are using is fresh. If the commercial yogurt you use for starter is old, the active bacterial culture may be mostly dead. Make sure you heat the milk to boiling temperature, and then cool to room temp. Make sure everything that comes in contact with the yogurt (pots, utensils, yogurt maker cups) are sterilized (very clean), like out of the dishwasher, or washed in hot soapy water. Make sure you do not add any other ingredients to the yogurt besides the milk and the starter. Flavorings are to be added when the yogurt is completely done and chilled. Hope these tips help. Proper fermenting temperature is also important. If you have an actual yogurt maker, this should not be a problem, whereas the oven method is trickier, because the temp. can fluctuate over the 24 hour period, and you may not know it. This could result in ruined runny yogurt. I remember at one time, someone had posted a whole list of tips for yogurt making. If someone still has this, please post it again. acidophilus means acid loving. So Mix it in and enjoy. >using a yogurt maker. I expected it to coagulate like commercial yogurt. >Although it is partially coagulated, it is more of a "runny" consistency. >Is that normal or did I mess something up? >machine. DOH! So, did I ruin the batch? population of bad guys in there. benefitial aspects to the diet. commercial starter, and see if it adversely affects me. I have never cared for the commericial yohurt for use as a starter. got it home. It didnot taste as nice as what I am using now. I'm a recent subscriber to the scd mailing list. I started on the diet in Dec 96 and continued till about the end of Jan of 97. At the beginning of the diet, I notice immediate improvement in my UC condition, however, I started having a return of symptoms (I figure from my use of soy sauce). I stopped the diet and am preparing to go back on it with renewed intensity. Just a couple of questions, when I was on the diet, I made the yogurt using a 60 watt light bulb in a cardboard box, because my oven was too large. I got the temperature just right 100-105, and the yogurt came out alright. I have recently purchased a commercial yogurt maker and the temperature is too high, above 115 using my thermometer. I was wondering if all commercial yogurt makers are designed to make yogurt within this temperature range. IF so, then the yogurt will not be made properly right? Ryan - Remember yogurt is an ANCIENT food, used throughout the ages by folk who had no thermometers, electricity, or glass jars. Try your machine - they probably would not make something that runs too hot. I'm still using the Salton yogurt maker I got at a local Home Express store on clearance for $10. I haven't tested the temperature, but I trust it meets the criteria for gently fostering the growth of the bacteria. I'm very happy with the resulting yogurt, and I haven't had any adverse reactions after several weeks of use. Since it only makes a quart, I just bought another one (they're now marked down to $8 - apparently they have several in stock, and no one else wants them). I doubt that Home Express offers mail order shipping, but if you want to try, they're in the phone book - Dublin, CA, area code 510.
when I used commercial yogurt as starter, but when I tried powdered starter, I could eat the yogurt no problem. >had used smaller containers. Am I right in thinking the liquid is whey (i.e. >times to see if less liquid is created. Don't wory about the whey, if you are fermenting more than 24 hrs then it will be lactose free. The curds, are mainly protein and fat and the whey is mostly water and acid. In commercial yoghurt the whey also contains most of the lactose. Elaine said, when questioned about the liquid whey that you should drink it too. The whey containing acid creates an environment that is dangerous for unfriendly bacteria and conducive tothe "acid loving" cultures. Also the temperature is critical for getting firm and lactose free yoghurt. Use a fresh starter yoghurt old cultures will grow more slowly. >they have a wide variety of different milks. To KD and others, As far as drinking store bought buttermilk instead of eating homemade yogurt, you would have to ensure that the product has no lactose, which can be difficult. You don't know how the company makes it and how long they ferment it. As the book says, it takes 24 hours of fermentation to get rid of virtually all the lactose, and most dairy producers do not bother fermenting their cultured dairy products that long, as it's not necessary to get a salable product. Since it is necessary for us on the SCD, we must make our own cultured products. As for using store bought buttermilk instead of milk or cream to make yogurt, I have never tried it, but I don't think it will work. If anything, you would get sour cream, not yogurt at the end of it. I did some research about cultured dairy products and learned how to make my own sour cream. Anyway, you can make sour cream the same way as yogurt, but it needs to be fermented at a lower temperature. The way I figured out how to do it is to make a batch of yogurt and then put the batch of sour cream ON TOP of the yogurt containers, and wrap the whole machine with a thick bath towel. I have a Salton yogurt maker with those 7 little glass cups. I simply don't put the big plastic cover on top of the machine, and put the sour cream batch directly on top of the little jars (in a bowl or other glass/ceramic container). Covering it all with a towel acts like a "tea cozy", retaining the heat. This way the sour cream can ferment at the lower temperature required. The only difference between yogurt and sour cream is the fat content (usually sour cream is made with full fat heavy cream, and yogurt is lighter); and the SPECIES of bacteria used as a "culture" are different. You can buy powdered starter for sour cream, or use buttermilk or commercial sour cream. I found it impossible to find a store bought brand of sour cream that has no bad additives though, so I use buttermilk whose ingredients are: milk, bacterial culture, salt. I don't think many people are aware that we are allowed to have sour cream on the SCD "if we can find one with minimal lactose", as it says in the book. Since this product did not exist in my area, I researched on the net how to make it. That's when I found out how to make DCCC also, but I'm not that ambitious, since I can buy a perfectly good DCCC here at the stores. Personally, I LOVE sour cream, and being raised on a lot of Hungarian cuisine which has a lot of sour cream in many of the dishes, I can find lots of uses for it. Try it, it really can add tremendous variety to your meals and it's something different! If anyone needs any more tips on making it, or recipes using it, just ask me. K.D., Unfortunately, I don't think your son will be able to get away with NOT making homemade yogurt or sour cream for this diet, because as I mentioned above, commercial producers don't have a need to ferment their products that long and we need products with very low levels of lactose. You could do the diet omitting the yogurt, but I think it is quite a benefitial part of the whole plan. >30 hours before removing it. time. It's 10 times better than any store bought yogurt or sour cream anyway. could contact to find out where to purchase one in your area is Lyo-San Inc. The phone # is 1-514-562-8525. Cycle. Hope this info helps. half and half, plus one paket of unflavored gelatin. would call these stores and find out where you can get a maker. Good Luck on finding one and Happy Yogurt Making! I also found the same Salton Maxim Yogurt Maker at http://www.qvc.com. the same model that the Salton-Maxim site has for 19.95. > Can you freeze yogurt and thaw it out as needed? disaster. It did not defrost into an edible consistency. could use it to make frozen yogurt and purree it in a food processor I guess. imagination. Look at all the flavours they have in the store bought yogurts. Try to copy them. Apple cinnamon is quite tasty. yogurt the first couple of days after I make it. It is not tart at all! then its probably not doing me any good, right? Bummer! you and your disease whether it's sour/tart or not. Chill out! (over 6 months!) I don't bother with sterilization in the preparation. sometimes, although I could easily live without it. cheap at $1.19 (Canadian) for 400grams (1/2 lb). yogurt starter that she got from the health food store. would do it? Otherwise I think I will return it. Hi Denise and all on the list. Re: Temperature contol for yoghurt making devices. These are my opinions, while not written in stone ,they do come from the School Of Hard Knox. and the need to make good yoghurt. A short back ground reference. I have U.C. and have enjoyed Elaine's Diet for four years and two months. First remission lasted over two years. The one and only flare I have experienced since beginning the diet, I believe resulted while trying to come off the diet. I ate refined sugars and starches, for a period of approx.six to eight months. The well known symptoms slowly but surely returned. With much pain, blood and HOT FOOTING it to the nearest restroom, it wasnt a hard decicion to realize I needed to go back to the diet. I am now into the tenth month of this remission. No meds. of any nature for nine months. Generally in good spirits, sometimes I have a good energy reserve, sometimes I dont, but I am no longer a young man either. In simple terms of my health, I look better than some I know at my age. Thoughout the entire diet of over four years I have always made my own yoghurt. I believe it to be an essential ingredient of the diet. With out going into how I choose to make my own yoghurt, I will address only the Control of the Heat of an electrical device used for the purpose of make yoghurt. 1. A good thermometer is of the utmost importance to knowing the temperature within the yoghurt, and shouldnt be attempted without it. 2. Regardless of the construction or present control of the existing unit you may use, if there is ANY doubt about temperature control, I have found the following to be exellent. By purchasing a plug into the wall electrical light dimmer switch, plug it into an electrical outlet. Although I will admit it is not thermostatically contolled, I have presently used this system for four years and find it exellent. Hope this will be of some benifet to those on the list making yoghurt. I will answer your questions should there be any. and half cream instead of milk also. Hope these ideas help. Good luck! your's is ask them to explain how you could have gotten such a hot one. thing you need to do before you rely on a thermometer is to "calibrate" it. a twisting motion 9 times out of ten the calibration has been comprimised. difference and add or subtract from any reading that you take. Exellent advice re: be sure your thermometer is accurate. I place my thermometer under my tongue if I feel it should be checked. It always comes out reading 98 decimal something, on a normal day . This allows the test to take place very near the temperature area it will be used in the 105-108 deegrees f.
answer, but first, I guess I should introduce myself. tel:1-800-433 3998. I just purchased a packet, under $2.00. that gets destroyed by the bacteria in the 24 hour fermentation. sure then you should phone Elaine to ease your worries. Good to hear you are finding some benefit from the SCD , hope you do well with it .It has made my life so much easier. I find the dry yoghurt starter makes a much better product,as well I would certainly be at the least sceptical of what other materials may or may not be included in the commercial ready made varieties. I have not used the Naturen Brand you mentioned, simply because I have never seen it in Alberta. I use a brand of dry culture made in Montreal,( thats not too far from you.) Ask the Health food store if they might bring some in for you to try. It is called "rosell" no capitals.I am very satisfied with it. Also tried a "Yogurtnet" starter, I didnt care for the taste of that. As I understand in your post you have come directly off the Predisone , and didnot come off of it gradually. Seems to me from the post I have read on this list that is not such a good idea. Maybe some one on the list here can advice you on that matter, I have never used that drug, so and have no personal experiece with it. But it may be worth checking. Post a note to the group and see what responce you get. >had mentioned, I didn't read the ingredient list. Learned my lesson! >adding extra acidopholus or bulgaricus powder to their yogurt? it doesn't agree with you, then you'll have something to worry about. it's good for you. Even if you need to lose weight, it will still happen. such contraption, then maybe you need a dimmer. intrigued me so I spoke to a biochemist friend of mine about it. but it seems to make sense, so I thought I'd share his opinion. >contain (swiss & cheddar) but not consume milk in any other form? on any of these details - other list members). > Also, is the Tomatoe juice made by Campbell's an allowable tomatoe juice. resort, you could write to the company and explain your situation. >yoghurt that's permitted on the diet? time than you may think. but to see it (read it), you have to sign up as a member (free of charge). For copyright reasons I couldn't just copy it and mail it to you. Lactose intolerance is not a food allergy but an inability to digest a sugar found in dairy products. Lactose intolerance is one of a number of food intolerances. The term "food intolerance" denotes a nonimmunologically based inability to properly metabolize certain food groups. The lay public often confuses lactose intolerance with an allergy to milk. Milk allergy is an immunologic problem that is different from lactose intolerance in its causes and treatments. It is estimated that 25% of American adults and 75% of adults worldwide have lactose intolerance; as many as 7.5 million Americans suffer from severe lactose intolerance. It is present in 15% of white adults, 45% of Eskimos, 81% of black adults, and 100% of Asian adults. Symptoms of cow's milk protein allergy include vomiting (which is uncommon in lactose intolerance), diarrhea (perhaps bloody stools), angio-edema, urticaria, rhinitis, nasal congestion and wheezing. All material on this server Copyright © 1994, 1995, 1996, 1997 by the publishers involved. long before it was ever placed on the store shelf. date embossed on the pouch" so it keeps well). with boiled milk, in order to eliminate all but the right kind of bacteria. which are not listed, or if they are using some sort of different culture. I had a flare (I believe) using half and half with the amount of starter prescribed for yoghurt made with regular milk. It wasn't tart at all, and a bit liquidy. If your yoghurt comes out this way, feed it to your kids or dog, but don' eat it yourself! Add more starter, and it works out great (I double it, like 3-4 heaping table spoons to one quart of half & half. You asked about powdered yogurt culture. Well, I've never ordered it myself, since I can easily buy starter in the shops here, but I found this site where you can order starter by mail. The first address is the main page, and the second one is the yogurt making supplies link. Hope this is of some help. By the way, for others who can't find dry curd cottage cheese or one of the substitutions mentioned in the book, if you are desparate to try it, and adventurous enough to attempt making it yourself, I'm sure you could acquire the supplies necessary through the same site. the prices on that seem really high. convenient source. Almond flour is much cheaper than this from Hughson's. Subject: Re: Lactobacillus vs. Acidophilus ... what's what? >help the flora of the intestine. Has anyone had this experience? And to explain further: there are a number of lactobacilli, such as L. Bulgaricus, L. Acidophilus, L. Casei, and L. Helveticus (the latter is named after "Helvetia", which is the native name for "Switzerland"; L. Helveticus is found in, you guessed it, SWISS cheese!). All these bacteria are fermenters of milk sugar; there are different strains of milk fermenters just as there are diff. strains of streptococcus & staphylococcus & every other darn germ / bacteria / "bug" under the sun ... people forget that "bugs" have "familes" and "clans" and "races" just like the biggest bug of all, people! I don't know anything about milk protein intolerance, but it would seem on the surface that it is a different thing from lactose intolerance. The yogurt recommended for the diet would take care of lactose intolerance, but not, I think, milk protein intolerance. Although sometimes once your gut is healed (from the SCD), you are able to tolerate proteins that previously would irritate. At any rate, there are products available that provide a range of the good-guy bacteria in a non-milk base. Usually these are powders that must be refrigerated. They are common in healthfood stores. My doctor has recommended such a product in support of the effort to return my gut's bacterial balance to normal. Personally I use this in addition to yogurt. So there are alternatives to yogurt. Just make sure that the product contains no starches or sugars. Subject: Where to buy good bacteria? 5E8 Bifidobacterium bifidum soluted in a glass of water. Pro-Symbioflor: 2x20 drops a day. Symbioflor 1: 2x20 drops a day. economically okay. Maybe even from the states. I am not sure why these bacteria works so good, but they certainly do more for me than more than 1/2 year of 100% serios SCD did. paratuberculosis, Listeria monocytogenes and Yersinia enterocolitica. who are infected with it. higher temperature than HTST pasteurization. UHT milk is "superheated"
Where can I get UHT dairy products? the phrases "UHT", "UHT Pasteurized", "Long Life", or "Longer Life"
meals, such as oven-baked lasagne, should effectively "home-pasteurize"
Great Question regarding the residual Mycobacterium Paratuberculosis (a bacteria which casues a condition identical to CD in many mammels) present in yogurt after heating (boiling) and fermentation. I too have been very curious to find this out. According to research studies, (http://iol.ie/~alank/CROHNS/uhtmilk.htmParaTB pages:- Why IBD sufferers should only ...). Only after UHT (Ultra-High Temperature) pastuerized milk is there no evidence of live M. Paratuberculosis present. Normal Dairy or HTST pasturized dairy has between a 5% and 25% incident rate of M. Paratuberculosis presence. The tempurature necessary to eradicate M. Paratuberculosis has been estimated to be 130 degrees C (266 degrees F). This is the temperature of UHT pasturization. We do not come close to this temperature in our heating prior to fermentation for our yogurt. So in addition to M. Paratuberculosis, other residual pathogens may survive. Perhaps using UHT milk to make our yogurt is the way to go. Has anyone tried this? had never drunk any milk." start the diet but am not on it yet. Some time ago I had explained on this list how to control the heat when using a crock-pot or any other electrical heating devices when making yogurt. I have used this method for over four years now and it will control your crock pot to with in one or two degrees, depending on how carefully you set it. Buy one regular type dimmer switch that you can plug into a 110-120 volt wall receptacle, from most any hardware dept, in any of the large chain stores. This small unit is normally used to plug a table lamp into and allows one to (adjust) or dim the light. Instead of plugging you light into the dimmer switch you plug your crock pot into it, allowing you to control the heat to exactaly where you want it, giving you exellent yoghurt each time. After setting it up for the first time using water only , you will get an indication of where to set the adjustment knob on the dimmer switch ,mark the point with small marking pen. It might take acouple of tries to get it perfect so stick with just water, untill you are happy with the temperature. If you have any question just give me a shout. This is a very simple and effective manner to control temperature of most any small heating or lighting device. A simple method to check the accuracy of your thermometer is to take your own body temperature (under the tongue of course), on a normal day. day. This new device makes 2 liters. The Canadian cost was $69.95 GST including postage. glass jars in my previous maker were chipping or breaking. It had some very helpful information & links. I've had my yoghurt heated as high as 120 with no problems. Since I've been using my variable temp pot, It's no so exact as using my yogert maker. I checked it one morning it seemed hot. After checking, it was 124ish. I was worried, but it was a wonderful batch. I have a little yogurt spoon with a thermometer in it. It is marked to have the temp. between 115 & 120 F.
> What is the phone no. for Salton yoghurt makers? if there's M.P. in the storebought yogurt we're using as a starter? Or is Lactobacillus antagonistic to M.P.? group devoted to yogurt making! Enjoy! >batch. We sometimes have a hard time finding organic yogurt without additives. "SAVING SOME YOGHURT FROM A PREVIOUS BATCH OF HOMEMADE YOGHURT TO USE TO START A NEW BATCH IS NOT AS SATISFACTORY AS USING COMMERCIAL YOGHURT AS A "STARTER" EACH TIME SINCE THE MANUFACTURERS OF COMMERCIAL YOGHURT MAKE EVERY EFFORT TO USE "LIVELY" BACTERIAL STRAINS AND EXTREMEMLY LARGE NUMBERS OF BACKTERIA IN THE MANUFACTURING PROCESS. THE CONDITIONS OF HOME REFRIGERATION MOST OFTEN DO NOT PROMOTE THE SURVIVIAL OF YOGHURT BACTERIA TO THE SAME DEGREE AS DO THE CONDITIONS MAINTAINED BY THE COMMERCIAL PRODUCERS OF YOGHURT. 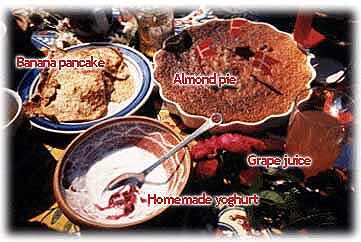 HOMEMADE YOGHURT, MADE BY USING SOME FROM THE LAST BATCH AS A "STARTER", OFTEN FAILS TO SOLIDIFY (COAGULATE) PROPERLY DUE TO INSUFFICIENT LIVE BACTERIA TO PREPERLY CONVERT THE MILK SUGAR." Subject: Re: Yogurt and geletin. >Can anyone tell me if gelitin is allowed to thicken yogurt in the SCD? Do not use milk powder for your yoghurt. Stick with regular milk and you can thicken it up by adding half and half to you milk, or use all half and half. It will become very thick by using any of the rich milks. Just a word of warning to you and any others starting out on the diet about yoghurt. It is recommended to eat lots of homemade yoghurt as one of the basic foods when starting out on the diet. I did this and couldn't understand why my symptoms got gradually worse. I eliminated the yoghurt and things immediately got better. I had started the diet once previously and failed to identify this intolerance, so beware. I did read earlier on the List that some people couldn't tolerate yoghurt, but didn't think it applied to me! (I wonder how common this intolerance is?) I'm told yoghurt is very mucus forming. I've been back on the diet 2 weeks and I'm living on chicken soup, chicken soup and chicken soup! With added carrots, turnips, zucchini, small amount of onion, celery and mixed herbs. It tastes good. I use organic produce if at all possible. I simmer the stew for a good while to make sure all the ingredients are soft and easily digestible. I did try pureeing the veg but I found it made it very bland and boring. I also eat rabbit stew, cod cooked in butter and shrimps as a change from chicken. I tried a smoked shoulder of ham but the fibres remain very tough no matter how much you boil it. For dessert, jelly made with grape or pear juice, honey and the odd ripe banana. For snacks I sometimes buy sliced ox tongue from my local supermarket - I checked the ingredients and there are no banned substances added; but be careful because sometimes in small shops tongue is sold out of a can with all sorts of disallowables in it. Does anyone have any ideas of what sweet snacks one can make at start-out: honey + what? Subject: RE: Where can I get a Yogurt Making Machine!!!!! I purchased the Yogourmet Multi yogurt machine and it makes great yogurt. I've never had any problems with it.